I missed seeing the Lord of the Rings in theaters… but with the Blu-ray Extended Edition I’m as close as I can get. Almost everything you could ever want (except the books) is included in this beautifully wrapped 15 disc box- set for $75.49. 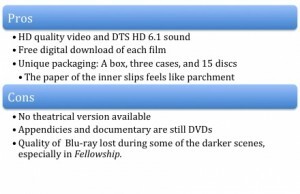 Each of the three movies in the trilogy: The Fellowship of the Ring, The Two Towers, and The Return of the King come on 2 Blu-ray discs each – totaling six discs of beautiful blu-ray quality. You really can’t ask for much better quality… yet. Why, you may ask, the necessary intermissions? The information compiled on extended editions are over 50GB for each movie, blu-rays carry 50GB tops. The extended editions of the movies contain much more footage than the Lord of the Rings you saw in theaters. To be precise: 30 minutes on The Fellowship of the Ring, 42 on The Two Towers, and 50 on The Return of the King. Unfortunately you can’t watch the theatrical versions; but it’s hard to say no to the extra footage of this epic anyway. The movies all have HD quality video, seat rumbling DTS HD 6.1 audio, and are equipped with BD Live (if that’s your bag). Also, if you are wanting to watch this on your computer or mobile device, the set comes with a free digital download. Ever wondered how the movies were adapted from the books? How they filmed an epic that expanded 100’s of miles… on one island? Or how about a look at the inner-workings of filming a battle scene with hundreds of cast and crew? The appendices are for the film aficionado, the Lord of the Rings fan, or simply an interested viewer who can’t get enough after watching the film. It would have been nice to get these on Blu-ray, but the movies themselves were the most essential, and the quality of the appendices are still up to par for the content. Fans will be disappointed that this as well, is not supported on Blu-ray. Now, most of the Lord of the Rings fans out there probably have the DVD set or extended editions gracing their shelves already. If so, there are only a couple reasons to upgrade. 1. If you love the quality of Blu-ray. Nothing gets as close to celluloid on the big screen as the last 1:30 of The Return of the King on Blu-ray at home. 2. The extra 3 documentary discs are well worth the watch for Lord of the Rings fans. For $75.49 at Amazon, any Lord of the Rings fan will enjoy this set of extended editions, appendices, and documentaries. Without a doubt one of the most complete and well put together sets in existence, unless you are anti-blu-ray, there is no reason not for you not to pick this up. It might seem a bit expensive, but when you look at the amount of extras and information provided, it feels like money well spent. No, it does not come with the theatrical versions, but who cares? The extended edition was made for a reason: because it’s what we wanted.